2014 Santa Fe Sport Special! The 2014 Hyundai Santa Fe Sport has great incentives and rebates allowing customers to save up to $4,500 on a new 2014 Santa Fe Sport vehicle! Now is a great time to buy a brand new SUV – fight this Chicago winter with a new Hyundai Santa Fe Sport! 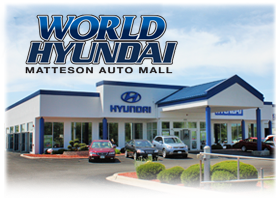 For a limited time only and while supplies last, head over to World Hyundai in the Matteson Auto Mall and test drive the all-new 2014 Hyundai Santa Fe. Great financing offers are available and we have financing on site at the dealership. Want to find out if you qualify before you come in? Fill out our free credit application and one of our representatives will contact you about your approved loan amount shortly.